The Ford Mustang is an automobile manufactured by the Ford Motor Company. It was initially based on the second generation North American Ford Falcon, a compact car. Production began in Dearborn, Michigan on March 9, 1964 and the car was introduced to the public on April 17, 1964 at the New York World's Fair. It is Ford's second oldest nameplate currently in production next to the F-Series pickup truck line. However the F-series pickup truck has undergone major nameplate changes over the years. The Mustang was Ford's most successful launch since the Model A. The Mustang created the "pony car" class of American automobile — sports car-like coupes with long hoods and short rear decks — and gave rise to competitors such as GM's Chevrolet Camaro, AMC's Javelin, and Chrysler's revamped Plymouth Barracuda. It also inspired coupés such as the Toyota Celica and Ford Capri, which were exported to America. 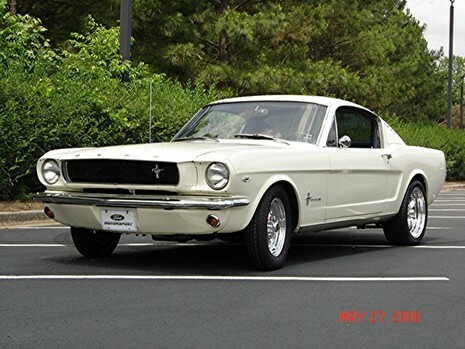 Mustangs grew larger and heavier with each model year until, in response to the 1971-1973 models, fans of the original 1964 design wrote to Ford urging a return to its size and concept. Although some other pony cars have seen a revival, the Mustang is the only original pony car to remain in uninterrupted production over four decades of development and revision. Introduction: The date was April 17, 1964. Intermediate sized muscle cars, with big block engines were gradually replacing the fullsized muscle car. Lee Iacocca, Ford's General Manager, had always invisioned a small sports car to be the next hot item in the street wars. Ford decided that instead of improving their lackluster intermediate, they would do the competition one better and introduce a whole new breed of automobile, the pony car. Originally designed as a two seater in the European tradition, Iacocca realized that true success depended on volume sales. 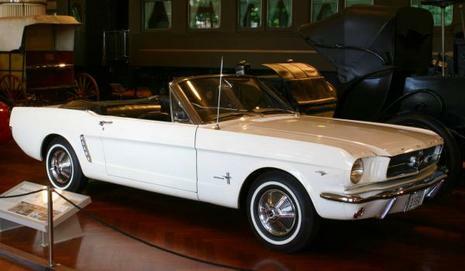 Therefore the Ford Mustang was introduced as a 1965 model that was based on the compact Falcon to lower production costs. It came with an obligatory back seat and a multitude of options that would give the buyer an opportunity to customize their purchase, and generate extra profits for Ford. Plymouth faithful stress that their Baracuda beat the Ford Mustang to market by two weeks. But it was the Mustang, which racked up over 22,000 sales its first day and one million sales in its first two years, that turned the market and people's attention to the pony car. The pony car class that the Ford Mustang helped create is the only class of muscle car that still exists today. Comments: The Ford Mustang debuted as a simple sports car powered by a 170 cid six cylinder and a pair of V8's. Originally named for the fighter plane, the P-51 Mustang, preliminary allusions were made to the horse, and the horse motiff quickly became the emblem for the Mustang. Buyers loved its low price, long hood, short trunk styling, and its myriad of options. Ford loved its high volume sales and visibility. In mid 1964, Ford introduced a sporty 2+2 fastback body style to go along with the hardtop coupe and convertible. Enthusiasts also cheered the new "K-code" 271bhp 289 cid V8 that finally put some performance to match the Mustang's good looks. For those that wanted more, the legendary Carroll Shelby and Ford collaborated to produce the Shelby GT-350, a Ford Mustang fastback specially tuned by Shelby. The 289 V8 produced 306bhp in street tune and around 360bhp in special GT-350R race tune. These Shelby's had no back seat, were only available in white and were fully race ready. It seems everybody has a favorite Mustang. With so many different generations to choose from the list is varied. 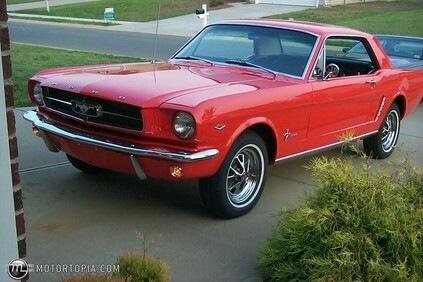 To some, a '66 convertible, red with a white top, a Pony interior and a 289 is the best ever. Or how about a fastback with the HiPo V8 and GT package? Ever heard a Boss 302 thunder around a race track? Others consider the 5.0L Mustangs the best ever largely because of the variety of low cost add-on parts available. These cars are relatively inexpensive to buy and to modify. The 4.6L DOHC Cobras come ready to run from the factory. In the early '60s the only American sports car was the Corvette at a price too high for most. The Thunderbird had grown into a large luxury car (and Ford heard many complaints about this). Imported sports cars, mostly from England, were selling well. Within a few years the post-war baby boomers would be buying their first car. The Mustang II concept car generated a lot of excitement and led directly to the first Mustang less than a year later. Ford was not unaware of how popular the car would be. They announced when the first television commercial would be shown and 29 million people tuned in to see it. The next day, the first day of availability, Ford sold 22,000 Mustangs.